The philosophy that is seemingly possessed by the programmers of Comodo Antivirus could easily be the best offense is a good defense. With this, Comodo Antivirus provides one of the strongest protective shields available on the market today. Taking advantage of various technologies including Sandbox, secure DNS, heuristic detection, cloud-based behavior analysis, large local signature database, and more, Comodo Antivirus delivers protection against viruses and other forms of malware that outperforms some of the most expensive antivirus programs…and it is absolutely free! Comodo Antivirus is configured to protect your computer from viruses, Trojans, worms, spyware, adware, hackers, and other kinds of internet threats. Sandbox technology allows programs to run in an isolated, Windows-like environment before being allowed to run with the general population. In this way, Comodo can observe a program to ensure it is not problematic before damage can be done. For the most part, Comodo’s Sandbox performed well; however, in some instances, valid programs were prevented from running correctly. Unlike Comodo Antivirus, very few free antivirus programs include heuristic technology. This technology provides analysis on the behavior of unidentified threats in order to properly identify and block. Heuristic technology combined with their signature database and cloud-based behavioral analysis allows Comodo to adapt and change in order to protect against evolving threats. 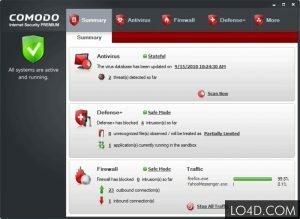 Comodo Antivirus is easy to use and install. Its effect on a system’s performance is very minimal and in most cases completely unnoticeable. However, its presence will be very evident in other ways. As it is, Comodo Antivirus is very cluttered with pop-up ads. These pop-ups are frequent, confusing, and obnoxious. Users of Comodo Antivirus will likely be very impressed with the program’s ability to prevent malware, however, with emphasis so heavily placed on prevention, Comodo’s ability to remove the malware that has been successful in penetrating a system proves to be lacking. When tested, Comodo proved to be unreliable in detecting malware on already-infested systems. Additionally, it proved unreliable in removing malware threats. Overall, you can’t beat the price of Comodo Antivirus. Moreover, its ability to outperform expensive programs in the area of prevention makes it very worthy of consideration. However, using Comodo may be risky because there is always the possibility a threat can make it into your system, and without the ability to detect or remove the threat, your computer will be at risk.